By adopting a resident sea turtle, you support the care of all our sea turtle patients, and help fund Gumbo Limbo's conservation programs to protect and restore our sea turtle population. Under a permit from the Florida Fish and Wildlife Conservation Commission (FWC), Gumbo Limbo’s saltwater aquariums are home to a resident sea turtle. We have one non-releasable green turtle named Morgan and a loggerhead named Cane. Our resident turtles serve as ambassadors for all sea turtle species. Our turtles, rehab patient or resident alike, receive species-specific diets tailored to their growth and health needs. Our turtles eat predominantly seafood and fresh green vegetables, which can be quite expensive. We also need to provide emergency, preventative, and expert veterinary care to all patients. 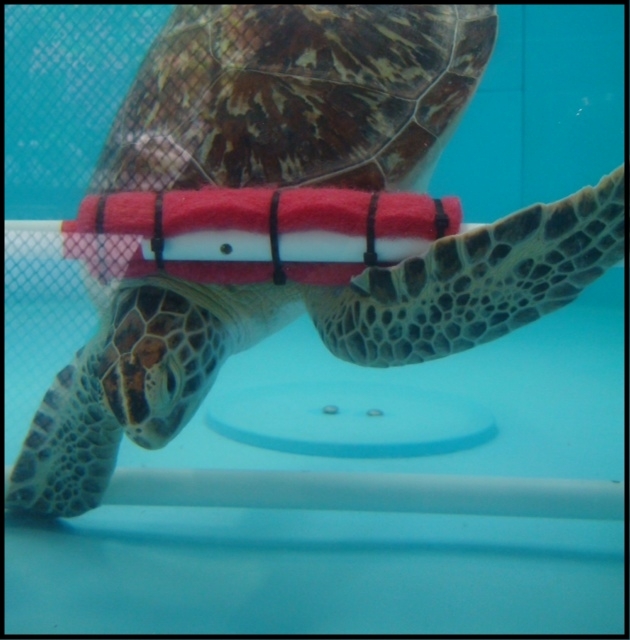 Your sea turtle adoption goes DIRECTLY to support the funding of the Sea Turtle Rehabilitation Facility, providing critical medication, tank maintenance, food and veterinary care. $1 Feeds a hatchling for a day. $5 Feeds a small turtle for a day. $10 Feeds a large turtle for a day. $25 Provides medication for a small turtle for a day. $50 Provides medications for a large turtle for a day. $100 Provides diagnostic testing for 1 turtle. $250 Fibropapilloma tumor removal surgery. $500 Care for a typical patient for its entire stay. And more. Unfortunately, there are expensive, but necessary, pieces of surgical and medical equipment that our staff needs to help take care of sea turtles and return them to health. An adoption certificate for the turtle of your choice. A letter from the adopted sea turtle telling their story. A photo of the sea turtle you adopted. High-quality informational guide on sea turtle conservation and research. Receipt of donation (for tax purposes). Small turtle plush toy to represent your adoption of an endangered sea turtle. Please allow 2-4 weeks for processing and delivery of your adoption packet. Disclaimer: Please note that this adoption is symbolic, and in no way implies ownership or handling of a turtle. By adopting a resident sea turtle, you support the care and feeding of Morgan and help fund our conservation and research that Gumbo Limbo implements out to protect and restore our sea turtle population. Morgan is a female juvenile green sea turtle admitted into our Sea Turtle Rehabilitation Facility on October 12, 2014. Morgan was found floating in Intracoastal waters in Stuart, Florida, sustaining injuries from a boat strike. This left Morgan with permanent partial paralysis of her rear flippers and buoyancy issues, keeping her from being able to dive for food or shelter. These injuries will require her to live out the rest of her life under human care. Morgan will remain at Gumbo Limbo as long as our aquariums can provide her with a suitable home. Cane is a juvenile loggerhead sea turtle admitted to our Sea Turtle Rehabilitation facility on March 20, 2017. Cane was found floating in the Intracoastal waters near St Lucie Inlet by local fishermen who noticed it was in distress. It immediately became apparent that Cane had suffered multiple injuries from a predator, most likely a shark. With significant portions of the front flippers missing, small portions of the rear flippers damaged, and an injury to the right eye, Cane would not be able to survive in the ocean. Cane will remain at Gumbo Limbo as long as our aquariums can provide a suitable home.